Thermography is the practice of using infrared images to measure changes in temperature across a given area, and it is particularly effective in roof repairs because of its ability to reveal roof system anomalies caused by heat loss. Roof anomalies are hazardous: any additional weight on a roof can result in ponding water and structural damage to the building, and it provides a breeding ground for mold. But finding roof anomalies isn’t so cut and dry. They’re often hidden underneath the roof membrane and require special diagnostic tools to identify. Roof contractors will sometimes take core samples (cylindrical cuts into the roof) to analyze the health of the insulation. But this ‘destructive’ method is invasive and, when the cores are replaced, create areas that will be more susceptible to leaks over time. Thermography provides a more targeted solution. Since water has an exceptionally high heat capacity, it gets hotter than it’s surroundings when left on a roof under the sun all day. The use of thermographic imaging quickly reveals these hotter areas and, by default, any anomalies. Targeting the source of a roof leak isn’t always obvious – it can often require a bit of detective work. When water penetrates the membrane, it will travel across the insulation until it finds an opening and then move along the deck until it enters the building below, at which point it might be hundreds of feet away from the membrane leak. Thermography can narrow down the search area dramatically: on a 300x400ft roof it might reveal a 10x10ft area with anomalies, which significantly reduces the labor costs of tracking down a leak. Roof membranes are excellent at repelling water, but the more punctures they sustain the more likely they are to experience issues over time. Core samples are an effective method of determining the composition of a roof, but they need to be taken at set distances across a roof to give a clear picture. 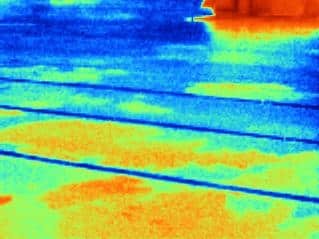 On a one million square foot roof, that means a lot of holes – and a lot of potential future problems – that could have been avoided using thermography. Cutting samples might also not be an option on a food processing or occupied building, where even the slightest amount of debris inside the building could result in health code violations or unhappy tenants. Thermography isn’t always necessary, but it is the right choice in certain circumstances. It’s particularly useful for freezer facilities, where vapor issues can cause frequent issues and are very difficult to locate using traditional invasive testing methods that might take days to resolve. Using thermography, a vapor issue might only take 10 minutes to pinpoint and begin repair procedures. Thermography takes the guesswork out of re-roofing. Using infrared imaging, a roof contractor can pinpoint within 10% certainty which areas of insulation show anomalies and need to be replaced: the rest can be reused under the new roof membrane without affecting the warranty. The effect is twofold: 1) it cuts out waste and inefficiency by replacing only what needs to be replaced and leaves the rest intact; and 2) it enables smart budgeting by taking the guesswork out of a re-roof. Instead of waiting until the re-roof project is underway to discover how much insulation needs to be replaced, it paints an accurate picture of the work that needs to be done and the exact cost of the project. Thermography is the smart choice for business owners who want to make targeted, strategic decisions with their roof repair and re-roofing projects.